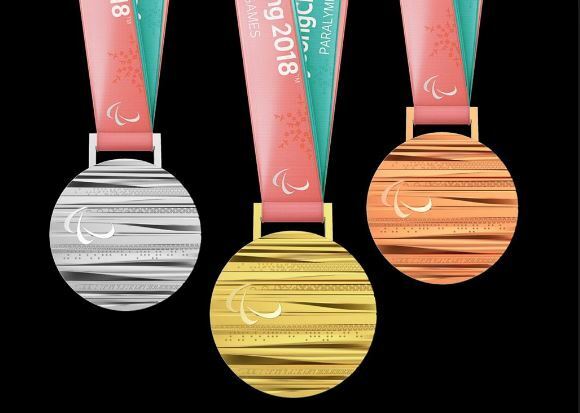 The medals for the PyeongChang Winter Paralympics are similar to those of the PyeongChang Winter Olympics as they are both inspired by unique Korean culture, but there are differences. According to local organizers Monday, both medals for the Olympics and the Paralympics were inspired by the Korean alphabet, "hangeul," Korean traditional clothing, "hanbok," and Korean traditional houses, "hanok." Both medals, designed by famed industrial designer Lee Suk-woo, use straps that are created with "gapsa" textile, which is used to make hanbok. The fabric is light and translucent, and is embroidered with a snowflake pattern. The Paralympic medals have logos and designs that are distinct from Olympic medals. The front of the Paralympic medal features "Agitos," the Paralympic emblem, along with brail letters that read "PyeongChang 2018." On the back of the medal, the name of the sport event and the PyeongChang Paralympic emblem are shown. Along the sides of the medal, the Korean consonants of the phrase "PyeongChang Paralympic Winter 2018" are carved in three dimensions. To emphasize the Paralympic value of equality, traditional patterns, including clouds, mountains, wind and wood that symbolize the beautiful nature of PyeongChang and Gangwon Province are displayed on horizontal lines. The cases to keep the medals are inspired by Korea's traditional beauty of curved lines and shapes that can be found on hanok.